Norwegian Jewel is a member of Norwegian Cruise Lines Jewel class, offering cruises to a host of destinations worldwide. The Norwegian Jewel is newly refurbished and ready to impress. Boasting the largest suites on the sea, you’ll find accommodation on board to fit your every need. For an ultimate luxurious cruising experience there is The Haven, featuring butler service and a private sundeck. When it comes to dining there is a selection of exotic specialties as well as some familiar comfort food. Whether you’re in the mood for sushi, Italian food or simply a cheeseburger, discover a range of choice at your disposal. There’s never a dull day onboard the Norwegian Jewel, as there is amazing activities and entertainment options. Chill out in the Sapphire Pools or the Spa Thermal suite, while the kids have fun and make friends at the Splash Academy. Where ever the night takes you, whether it be to the mojito bar or the dancefloor at the Bliss Ultra lounge, you are sure to have an unforgettable experience. There is a cabin on board the Norwegian Jewel for everyone, whether you want a cosy place to call home for the duration of your stay or a lavish suite where you can enjoy a luxurious cruise. Stylish and sophisticated touches are all around the rooms to enhance your cruising experience. The highlights of accommodation on board are the Suites, where you will find a spacious cabin with superb personal butler service and a large private balcony which is perfect to relax on. 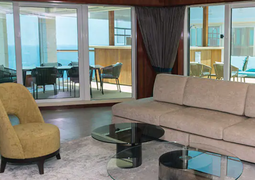 At the very top of the ship are the Haven category of Suite, where you will find the ulitmate place to enjoy your cruise complete with multiple bedrooms, massive living space and a private garden for your own personal oasis. For families there are spacious mini suites, accommodating up to four people comfortably. On board the Norwegian Jewel, the dining options will be sure to keep every passenger satisfied. In the main dining rooms you can enjoy beautifully crafted and contemporary dishes prepared with the finest ingredients. Other options on board include 'The Great Outdoors' serving a wide range of classic ready to serve foods, 'Chin Chin Asian Restaurant' providing freshly prepared Asian fusion delicacies and 'O'Sheehan's', where classic American and favourite comfort foods are served 24 hours a day. After dining, bars and lounges such as 'Magnum's Champagne & Wine Bar', 'Maltings Beer & Whiskey Bar' and 'Shakers Martini & Cocktail' will provide you with a place to enjoy a drink in an cool, relaxing environment. There will never be a dull moment on board with the range of entertainment options on board. The 'Band on the Run' show provides a tribute to the music and dance of the 70's, while 'Le Cirque Bijou' is a show full of awe-inspiring acrobatics, gymnastics, singing and dancing. The Comedians and Magicians on board are sure to keep you entertained and the White Hot Party is an electrifying party under the stars and the perfect way to finish a day on board. Bring your game face to the outdoor Sports Complex for basketball, volleyball and more. For those who enjoy exercise the Body Waves fitness centre and a high-energy Zumba fitness class are perfect, or you can seek inner peace at one of the daily yoga routines and breathe in fresh ocean air. For something a little more laid back, you can enjoy a wide variety of literature available in the comfortable and elegant library, while the Mandara Spa offers a wide variety of spa treatments to rejuvenate your body and soul. Discover the awe inspiring regions visited by the Norwegian Jewel, including Alaska, the Caribbean and Bahamas as well as the beautiful Panama Canal. Dreamlines highly recommend sea travelers to select all three of these routes for a truly unforgettable cruising experience. Both on shore and at sea guests can experience the wonders of Alaska. On shore highlights include panning for gold, riding the historic White Pass & Yukon railway or taking a flight above the jaw dropping Misty Fjord, a 300 metre high waterfall. Explore Alaska aboard the Norwegian Jewel cruise ship and marvel at the pure beauty of the unique landscape. From the comfort of your balcony passengers can appreciate the spectacular forests, snow covered mountains and impressive ice bergs tearing at the water like a sculpture of ice. To find out details on cruises to the Bahamas and the Caribbean don’t hesitate to get in touch with CruiseAway. 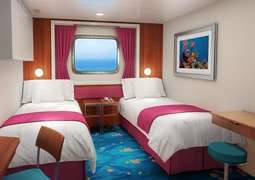 Guests wishing to relax in style and comfort whilst at sea won’t have to look far aboard the spacious Norwegian Jewel. 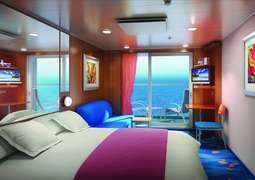 Boosting elegantly designed and beautifully proportioned cabins, CruiseAway is more than happy to discuss in detail all of the luxury sleeping accommodation on board the Norwegian Jewel cruise ship. However, read on to discover the fantastic range of suits available on the Norwegian Jewel cruise liner. Take for example, the grand 3 bedroom Garden Villa. Set over a massive 4,891 sq ft. lounge around in the impressive, panoramic living area with a large centrally positioned, curved sofa, dining area and a grand piano. Sleeping up to eight people the grand 3 bedroom Garden Villa has either a king size or queen size bed in each bedroom, a connecting on-suite bathroom with a large bath tub in the main master bedroom. In addition, the luxuriously furnished Garden Villa comes complete with a large hot tub to allow guests to relax and unwind in style. The Grand Villa also permits access to the private courtyard area. If you’re looking for something more intimate yet equally as luxurious book a cruise in the Owner’s suite. Spacious decadence welcomes guests booking this category of cabin. Complete with a separate master bedroom and decorated with mellow creams and reds this cabin has a pleasurable environment to unwind in whilst cruising at sea. A large walk-in wardrobe, lavish bathroom with walk-in shower and large bath tub and cozy living/dining area to enjoy some quality family time or share a romantic moment make the Owner’s suite the perfect environment to recuperate whilst at sea. 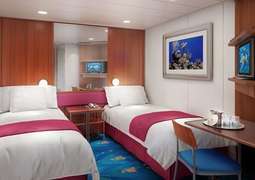 If you wish to find out more about these impressive staterooms already mentioned or if you wish to discover the full range of cabins on offer aboard the majestic Norwegian Jewel, simply consult with one of the dedicated members at CruiseAway. Like all of the Norwegian fleet, the Norwegian Jewel insists on providing guests with a spectacular range of eating experiences. If you don’t believe this, simply get in touch with a member of the CruiseAway team. Included in the cruise price, guests can sample delicacies in the three main dining options. First of all the Azura dining hall seating up to 328 hungry diners, designed around a boutique hotel, serves up healthy, tasty dishes designed to please. Open all hours the next eating option on the list is the Blue Lagoon. Whether you desire a fast food classic or an Asian snack, head to the Blue Lagoon with friendly waiting staff and an incredible view out at the unending blue of the sea. The main dining room, the Tsar’s Palace, acclaims inspiration from the awe inspiring palaces of the old Russian monarchy. Sit back and enjoy the award winning five course menu in a truly majestic setting!